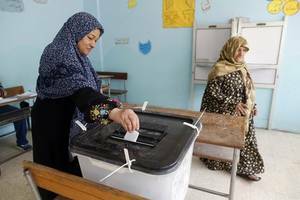 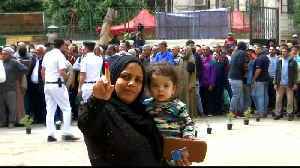 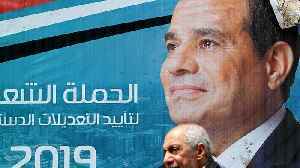 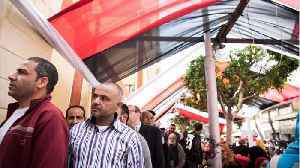 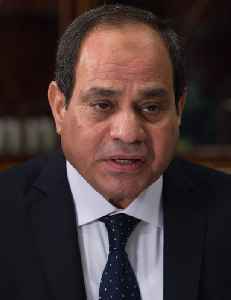 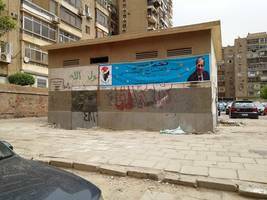 Cairo: Egyptians on Monday were voting in the last of three days on proposed constitutional changes that could allow President Abdul Fattah Al Sissi to stay in power until 2030. 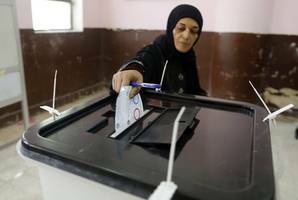 Long lines of voters.. 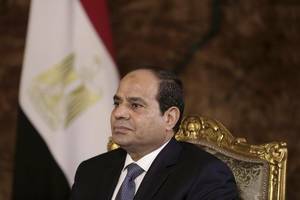 Opponents of constitutional amendments that could see Egypt's President Abdel Fattah al-Sisi stay in power until 2030 urged people to vote "no" on Monday, the third and final day of a referendum on the..
Reuters reports Egyptians voted for a second day on Sunday on whether to add constitutional amendments to allow President Abdel Fattah al-Sisi stay in power until 2030. 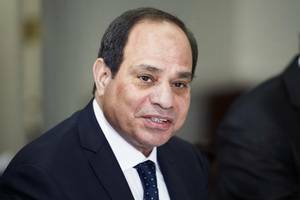 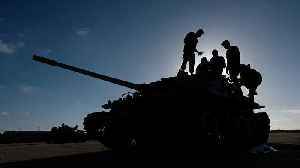 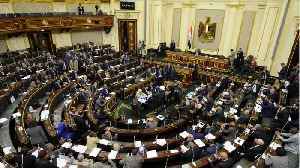 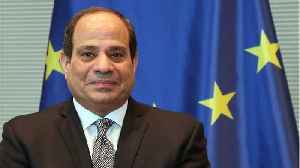 The three-day referendum was..
Egypt's parliament have approved amendments to the constitution that could keep President Abdel Fattah al-Sisi in power until 2030. 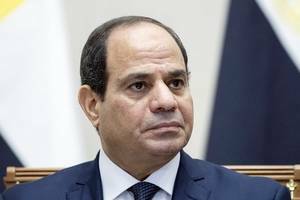 The reform must still be endorsed in a referendum which, if approved,..
Egypt released photos showing the commander of the LNA Khalifa Haftar with Egyptian President Abdel Fattah el-Sisi after they met in Cairo on Sunday, but no other details were given about their..
Egyptian pro-government media urged a "yes" vote Sunday, the second day of a nationwide referendum that would allow President Abdel-Fattah el-Sissi to stay in power until 2030. 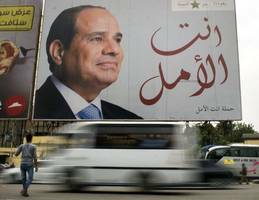 Critics have blasted the..
Cairo: Egyptians were voting Saturday in a referendum that aims to cement the rule of President Abdel Fattah al-Sisi, the former coup leader who presents himself as a rock of stability in a turbulent..
CAIRO (AP) — Egypt’s state news agency says expats have started voting on constitutional amendments that would allow President Abdel-Fattah el-Sissi to stay in power until 2030. 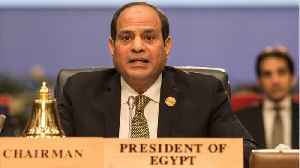 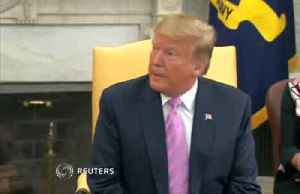 MENA reported that..
Egypt's parliament has approved constitutional amendments that would allow President Abdul Fattah al-Sisi to stay in power until 2030, BBC News reports. 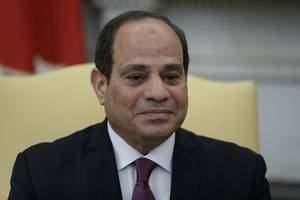 Sisi is due to stand down in 2022, when his..
Egypt's parliament on Tuesday approved amendments to the constitution that could keep President Abdel Fattah al-Sisi in power until 2030, though they still have to be endorsed in a referendum to take..
President Sisi blocked access to opposition websites, introduced draconian penalties and vowed to punish journalists ahead of vote As the world watches the peaceful revolution that is changing Sudan in..
Egypt's President Abdel Fattah al-Sisi on Sunday met in Cairo with Khalifa Haftar, the commander of eastern-based Libyan forces, who is under international pressure to halt an advance on the capital..